As 2013 comes to a rapid close I imagined how the natural world (animals- our dogs) would process a “New Year.” Of course, they don’t really care or are not really aware concerning things like our New Year’s celebrations because they already live totally “in the moment.” Each day for a dog could be viewed as a brand New Year! Take that thought to heart when dealing with a puppy or dog with a behavioral issue…it should help you greatly! As we reflect back on a (hopefully) excellent year and excitedly anticipate an even better new year remember to work with and explore Mother Nature a bit more this next year. Take the time to slow down. Breathe. Reflect. Meditate. Concentrate. Focus. Relax. Get out of doors. Put your cell phone down! Have family meals together. Use the Slight Edge (an excellent book by Jeff Olson- I highly recommend it) daily in your life. Act on purpose. Make more friends. Basically, act like a calm social dog would. Social dogs run to get the heart rate up and play with friends. They hang out socially. They would explore and traverse large territories outside if we let them. They guard our hearth and home. Our dogs stand as one of our last links to a simpler and better time. A time linked to Mother Nature. And we can join them in that world at the drop of a hat if we so choose. Do it. You won’t ever regret slowing down to catch up with what is important to the animal that lives so closely with you and your family. Start out the New Year like a dog. Stay moving and exploring. Get outside. Cuddle with your pack at night. And always guard what is most important in life. Happy New Year from your local neighborhood dog guru! It seems the holidays are already knocking at our door and soon we will have, literally, many relatives, guests and holiday visitors knocking too. There is no better time to start getting our rambunctious dogs under control at the front door. Far too often I see dogs and pups bark, climb, jump, scratch, nip, mouth (and in many cases growl and attempt to bite) at the door. The main thing we must help our dogs understand is how to calm and get right into the action of smelling the guests. And, of course, the dogs can’t do that if they are put away or behind a gate, or held so far back that they never can smell the visitor. If you have a dangerous dog obviously proceed with caution and get help(call me) but if not remember a pup or dog has a biological need to smell a new person entering the home environment. Everything in the canine world is based on touching and smelling. The dog or pup needs to learn to switch from an excitable habit of staring and constant movement near the entryway to actual thinking and investigating with their wonderful noses. This can only be done through great leadership from the owner. Dog leadership is very easy to define. Dog leadership is also very easy to see. If you truly wish to see dog leadership all you need to do is go to any dog daycare or dog park and watch for the calm, firm yet social dog in attendance. You will soon discover that “Alpha” dog leadership is mostly like good human parenting. It is not what many people imagine as domineering and over-controlling but instead is calm, patient, firm and exceptionally fair about the canine social rules (Alpha/parent or grandparent dogs are excellent peace-keepers among the group and many dog daycare owners love having them in their pack because they naturally help with the rest of the dogs.) (FYI- you can argue about linguistics and labels all you want. For my part I know for a fact that certain dogs with excellent language and social skills do exist and they act cool, calm, and collected, competent, confident, and with great self control. I call them alpha dogs. They do not over-police situations. They do not cause fights – they prevent fights in a fun and relaxing fashion. They are just like great parents.) Fun fact: Scientists have studied and proven that canines make spectacular parents and are often better at parenting than primates! So, with dog leadership in mind you will have to be pretty firm at first (spatially speaking do NOT let the dog blow right past you or control any space near the doorway) as you teach your dog about the doorway and then very calm right after. Remember, there are no bad or good dogs, there is only reaction and habit and differing energy levels. As soon as the doorbell rings or you hear a knock and your dog starts speeding for the door…stay calm. Be patient as you practice. Next, move to the door in an assertive manner. No need to run but walk with purpose. Never open the door when a dog’s face is in front of your body and they are forcing their face in the crack of the door. This is when you must claim the doorway and your own dog and back them up at least two to four feet (enough to give yourself some room to open the door and to not let them dominate/claim the door or guest or explode out the door). Picture a basketball player playing defense. The door is the hoop and you want to stop them from driving forward. The main goal here is trying to get the dog to stop doing the overexcited habit of barking nonstop, or moving constantly, or jumping on the guest, or exploding out of the doorway, or trying to attack the visitor, etc. You have to get your dog’s eye contact for a moment and they have to physically slow their movement way down (it’s best if they stop moving all together). Do NOT pay your dog for eye contact by using a treat! (If a dog does something in return for payment it certainly does not mean the relationship is healthy or respectful) Be comfortable using the leash inside as you practice this greeting initially. If you get eye contact then you can turn around and answer the door. Once you open the door, be prepared for a rise in the dog’s energy and movement again and repeat the above procedure! Then (if they aren’t aggressive) let them go and get into smelling your visitors. Smelling is an excellent way for a dog to gather information and also calm down quicker. If you don’t get the eye contact or the calmness it means you need help and I’m a phone call or email away. The holidays can be a ton of fun or they can be stressful…the choice, my friends, is up to you. Good luck and may all your greetings be good ones. Garrett Stevens is the author of the Hot-Listed book on dog and human behavior DOG MYTHS: What you Believe about dogs can come back to Bite You! He excels in dog rehabilitation and is a specialist in canine energy and body language. Tacoma based, Garrett trains, whispers, and rehabs many dogs and pups a day while also working on his other books and training videos soon to be available to the public. For more info go to http://www.gstevensdogtrainer.com and buy Dog Myths it will shock you, enlighten you and equip you and your pet to move forward together into the wonderfully calm future! Dogs have earned the title of “Man’s Best Friend” throughout history, with tales coming from all over the world with the common thread of the faithfulness of dogs. The most common dog name, Fido, comes from fidelis in Latin, or “I am faithful.” Stories such as that of Capitán, a German Shepherd who ran away from his home In central Argentina after the death of his owner Miguel Guzmán in 2006. A week or so later, Guzmán’s family found Capitán standing guard at Guzmán’s grave after finding the cemetery on his own. When brought home, Capitán again ran away back to the grave of his former owner. 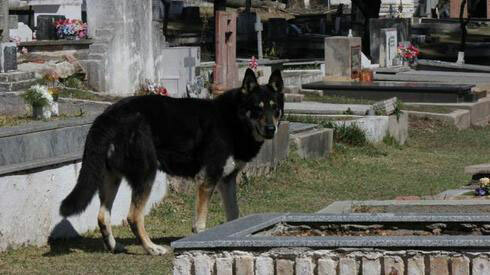 As of January, 2013, he continues to stand vigil over his owner’s grave and receives provisions from the cemetery staff so he does not need to leave. 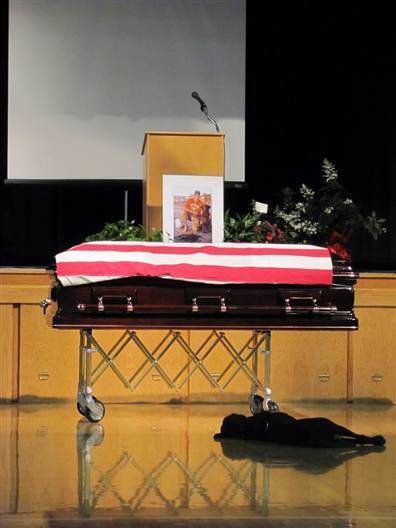 Hawkeye, a Labrador retriever, stayed by the coffin of his owner, Jon Tumilson, a Navy SEAL who was killed in Afghanistan on August 06, 2011 when the Chinook he was riding on was shot down by a rocket-propelled grenade. Carlo Soriani died in an air raid in Italy in 1943 during WWII; his dog Fido waited for his return for the following 14 years, going daily to the bus stop where the man used to get off after coming home from work. Heidi, a Jack Russell terrier, made her way down a 500-foot drop in Scotland to get to the body of her owner after he fell to his death while hiking and stood guard over his body for two days in 2001. There are countless stories of the faithfulness of dogs to their humans. Such amazing devotion is surely why they hold the title Man’s Best Friend. As you spend time with your dog today, be sure to exercise, set rules and be the sort of leader your dog will happily follow. In Anchorage, Alaska, it is illegal to tie a pet dog to the roof of a car. In some areas of California, it is illegal for animals to mate publicly within 1500′ of a tavern, school or place of worship. In Belvedere, California, no dog shall be in a public place without its master on a leash. In Denver, Colorado, the dog catcher must notify dogs of impounding by posting, for three consecutive days, a notice on a tree in the city park and along a public road running through said park. In Hartford, Connecticut it is illegal to educate dogs. Garrett often shares tidbits from his training appointments with me and one thing is consistent: it’s often the humans that are being educated, not the dogs! 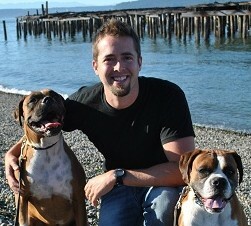 For a top-notch education for humans and canines alike, contact Garrett Stevens and Alpha and Omega Dog Training! Me throwing the Frisbee for Rambo at Ruston Way Waterfront, Tacoma, WA. Working Rambo in his “prey drive.” Use an item to excite the dogs energy and get them using those extra rods in their eyes (many predators have more rods than cones so they can pick up and detect movement better than we do) bring them to the point of almost jumping and snapping for the item and then try to be as correct as possible with your own body language while manipulating the dog into certain positions (sit, down, heel, fetch, et cetera). When we utilize the dog’s natural chase and grab instincts they Looooove this kind of learning and focus work. Have fun. Play train!